Bringing peace to this world can and will be done. But it will most definitely separate the men from the boys, or the religious imposters from those who truly follow the Words of the Savior, Yahshua Messiah. We see the end time Prophecies that show this world, all nations are going down. In fact, Prophecy shows the nations falling by their own destructive ways. Notice just a few of the Prophecies, that can be seen, being fulfilled at this time. Cain chose war and it has been continuous. The twelve tribes rejected Yahweh’s Guidance and Protection, and chose kings and war instead. Keep in mind that when these Prophecies were written, there were no explosives, not even a firecracker. But they are foretelling of a precise generation, in which we now live and can see those things active and being used, as if the death and destruction of others means nothing. The Great Prophet of Yahweh, Malakyah, describes the activities of the destructive devices used. Notice, the burning is the same as is shown by Yahweh’s Prophet Isayah. The Savior, Yahshua Messiah, shows the same event and shows us the time period in which this great burning will take place. The last revelation given to mankind shows these same things, plus the Prophesied Work of Yahweh that would teach abreast of these destructive wars of burning. We are also shown some details about the quartet and the religions that lead them into this great destruction. We see that nuclear wars will take only a short time to devastate the earth, as was shown in Isayah 24:18-20. 4 And there went out another horse that was red; andpower was granted to him who sat upon it to take peace from the earth, and that they should kill one another; and there was given to him a great sword. 29 Immediately, but after the GreatTribulation of those days will the sun be darkened, and the moon will not give her light, and the stars will fall from heaven, and the powers of the heavens will be shaken. These wars of the quartet and the roman catholic church started September 12, 2006. But as the Book of Revelation shows, these wars were held back by Yahweh for a reason. For details and news articles showing on that exact date war did actually begin, but was stopped by a military general, get our book, Birth of the Nuclear Baby and the accompanying news articles. Few men will be left alive. Did you notice the words continual war? The tribes of Israyl chose war. The following information comes from Strong’s Exhaustive Concordance. We see in these two verses that the religions’ Gods and lords that they worship are actually demons. The King James Version says devils. But there is only one devil. Her servants that follow her are heavenly beings who left their assignments and, along with Satan the devil, now teach evil and deceive the world. Notice, mankind has chosen to be like the Gods instead of the Creator Yahweh. Compare on this point, demons. The Gods (demons) also influenced Cain. Please notice what Yahweh the Creator just told you. You’re not acceptable to Yahweh if you practice sin. You’re not acceptable for that which mankind was created. 13 I am the First and the Last, the Begin­ning and the End. If you do not repent and convert, you cannot overcome sin. This is the Message from the beginning. They also influenced the elders of the twelve tribes and their fathers, who worshipped these Gods or demons in Egypt. Please notice, they forsook Yahweh in Egypt and served the Gods of Egypt. The religion in Egypt is even today called coptic catholic. How? By practicing sin! Sin – breaking Yahweh’s Laws of Righteousness – creates lust in your mind. Lust leads to envy, which leads to hatred and rage. Notice the words of the Apostle Shaul. 13 For you were called into liberty, brothers, but not liberty to be instruments of carnality; but through the love of Yahweh, serve one another. 14 For truly, everything in the Laws through the Plan of Yahweh, has been accomplished through this: You will love your neighbor as yourself. 15 But if you bite and devour one another, be careful that you are not consumed by one another! 16 I say then: Walk in the Spirit, and you will not perform the lust of the flesh; carnal passions. 17 For the lusts of the flesh are against the Spirit of Yahweh, and the Spirit of Yahweh isagainst the lusts of the flesh; for the one opposes the other. So, be mindful, and do not do just anything you desire to do. 18 For if you are led by the Spirit, are you not under the Laws? 21 Envy, murders, drunkenness, revelries, and the like; of which I warn you beforehand, just as I did in times past, that those who practice such things will not inherit the Kingdom of Yahweh. 23 Meekness; gentleness, humility, temperance; self-control—such things are not against any Law. 24 And those who are the Messiah’s have sacrificed the flesh; the carnal mind, with its passions and lusts. What is this Spirit of which Shaul speaks? Read and believe. He will appoint captains for his army__captains over thousands and captains over hundreds. Your sons will plow his ground, others will bring in his harvest, and others will manufacture weapons of war and equipment for his chariots. So, do they influence the religions in this present prophesied generation to manufacture weapons of war and not repent of their works? 17 And in my vision, I saw the horses and those who sat upon them like this: They hadbreastplates of fire; red, and of jacinth;blue, and brimstone; yellow, and the heads of the horses were as the heads of lions; and out of their mouths issued fire, and smoke, and brimstone. The three colors given in Revelation 9:17 are the same three colors that make up the nuclear mushroom cloud that results from the explosion of a nuclear or atomic bomb. For more information concerning these colors of the mushroom cloud read pages 125-126 of The Mark of the Beast, Volume 2 or pages 125-127 of Birth of the Nuclear Baby. The whole world, except for the Seven Prophesied Works of Yahweh, follows, serves, and worships Satan and the demons, that they call Gods and lords, for the 6,000 years of man’s history on earth. Their manufacturing of weapons of war virtually stayed the same until 1934. Daniyl, the Prophet of Yahweh, wrote around 534 BCE that knowledge would be increased for mankind, and with that knowledge, mankind would still show his demon worship by building and manufacturing weapons of mass destruction. Daniyl shows this will bring about a great time of trouble in this same generation that brings the end of man’s rebellious governments and rebellious religions of and by the people, not the Righteousness of Yahweh. Couple that with Yahshua’s Words concerning the Last Generation and the bombs that darken the sun. Iniquity is what we see in all of the religions and governments of the world today. None teach or seek Yahweh’s Kingdom and His Righteousness, except the Last Days’ established House of Yahweh. According to the Greek dictionary in Strong’s Exhaustive Concordance, the word iniquity is word #458 from word #459, and means:not subject to the Laws; that is,doing away with the Laws. Notice what this spirit of iniquity is. You can read more about the increase of computer knowledge which started in 1934 in our 2013 issues of The House of Yahweh Newsletter and The Prophetic Word magazine. As to whether or not the Prophecies are true, you can plainly see, without doubt, they are absolutely true. The Name of the Savior, Yahshua Messiah, was removed from Scripture and replaced with the names of two Gods from Egypt, and the title lord or ‘the’ lord. Call, write, or email us for information. Yahshua Messiah shows that those who worship Gods (Gen. 3:5) and teach the evil of manufacturing weapons, do not know the way to peace. Nor will they accept Yahshua’s Instructions that would bring them both Peace and Salvation. Even after a third part of men are killed in and around the great River Euphrates by nuclear wars in this present prophesied generation, they still will not repent. Prophecy shows that four-fifths of the earth’s population will be killed before they finally destroy all their means of manufacturing and using weapons of fast delivery mass destruction. Notice what the Gods are preparing now for you and your children. 26 This is the purpose;plan, that is purposed upon the whole earth; this is the hand that is stretched out upon all the nations. The US, the UK, Russia, China and France are rebuilding or upgrading their arsenals of nuclear weapons. The other four nuclear states (Pakistan, India, Israel, and North Korea) too are ‘improving’ their arsenals. The nine nuclear states have over 10,000 nuclear weapons in their stockpiles. This is enough to wipe out the entire population of the planet many times over together with all other life forms. 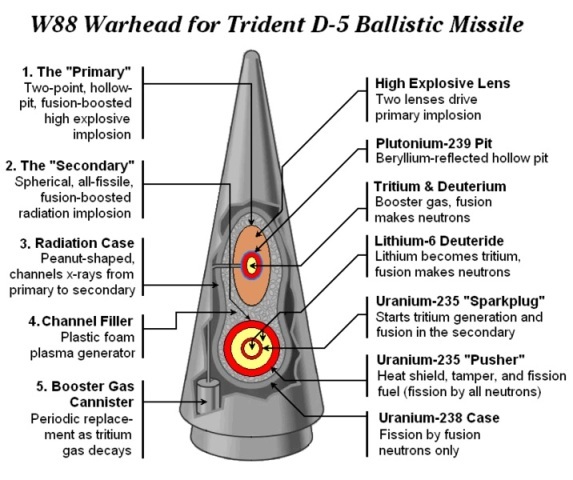 A single United States thermonuclear warhead, designated W88, has an estimated ‘yield’ of 475 kilotons. The ‘yield’ is the destructive power expressed in tons of TNT equivalent. TheW88 is over 30 times more destructive than the bomb which wiped out Hiroshima. The US government has 5 nuclear submarines on patrol at all times carrying 1000 times the destructive power of the Hiroshima bomb. Is it possible to imagine the degree of paranoia represented by such a standing threat? The UK government has started to spend one hundred billion pounds on rebuilding its Trident fleet of nuclear submarines, each one with the capacity to incinerate over 40 million people. …the US and Russia who keep 1,8000 weapons on high alert atop long-range ballistic missiles that are ready to launch 5 to 15 minutes after receiving an order! It’s a very difficult decision in today’s world to choose Righteousness, repent of sin, and convert to keeping Yahweh’s Laws, destroy all weapons and learn war no more; because, as Yahshua Messiah said, iniquity increased sharply from the many pulls of television and the many religious imposters teaching iniquity. And many false prophets will rise, and will deceive the many. False prophets cannot bring forth Righteousness. The Righteousness of Yahweh is exactly what the Savior demands. But the religions today can only bring forth the evil of the Gods they have chosen to worship. The world is filled today with preachers that are teaching their subjects to sin, even claiming that the Savior and His twelve Disciples taught the world to sin. Satan is very subtle. She gives those who love darkness (evil) what they want to hear. And this generation wants to hear it more than any other generation before them; because they have been taught to sin from the day they were born. It comes into the hospitals, the homes, and even the churches. It comes from television, radio, the Internet, schools, churches, and homes, due to iniquity increasing. Don’t lie to yourself. You know your religion is teaching that Yahweh’s Laws of Righteousness are abolished. That is iniquity. Another thing that makes it hard to choose Righteousness is the persecution from religious establishments that control the municipal systems of the nations. This also is prophesied for this generation. Yes, Truth; the Laws, is suppressed; and he who departs from evil; upholds the Laws, is accounted as mad;makes himself a prey! Yahweh saw this, and it displeased Him thatthere was no justice in the Last Days. The Prophets of Yahweh plainly show the way to Eternal Life and connection with the Creator Yahweh. There is a prophesied Place of Protection for those who will repent and be converted to Yahweh’s Righteousness, as your bible says. Notice, Yahweh is the Most Powerful Being in the universe. He already has protection set up for those who want to come out of this God worshipping world of evil. For more information on this Protected Place, call, write or email us. 21 But if the wicked will turn from all his sins that he has committed, and keep all My statutes, and do that which is Lawful and right,then he will surely live; he will not die. 22 And his transgressions that he has com­mitted will not be mentioned against him; in his Righteousness that he has done, he will live. 14 For sin will not rule over you. For are you not under the Law, and therefore under Yahweh’s undeserved pardon? 15 What? May we sin as though we are not under the Law, yet under Yahweh’s undeserved pardon? By no means! 16 Do you not know that to whom you yield yourselves as servants to obey, his servants you are whom you obey—whether of sin, which leads to death, or of obedience, which leads toRighteousness? Now are you ignorant, brothers (for I speak to the ones who know the Law), that the Law has authority over a man as long as he lives? 12 And I saw the dead, small and great, stand­ing before Yahweh. And the books were opened; and another book was opened, which is The Book of Life. And the dead were judged out of those things which were written in the books, according to their works. In this time period, the pull is great. Men will be lovers of every form of evil. 4 Traitors; betrayers, headstrong, arrogant, lovers of pleasure more than lovers of Yahweh. 2 And walk in love, as the Messiah has also loved us, and has given Himself for us an offering and a sacrifice to Yahweh as a sweet-smelling aroma. 4 Neither filthiness, nor foolish talking, nor vulgar jesting, which are not proper. Instead, let there be giving of thanks. 10 Proving what is acceptable to Yahweh. 12 Even though it is shameful to speak of those things which are done by them in secret. Surely, you can see by now that the religions have chosen evil over Righteousness and are trying to cover their track record with lies as the Apostles show. Don’t let them deceive you. Read your bible. In this present generation, the Tribulation is building. So is the Message of the Kingdom of Yahweh. His Righteousness is going out to all the world. In the beginning, Yahweh offered mankind the opportunity to become an eternal member of The House of Yahweh. The House of Yahweh is forever, as we see in the famous 23rd Psalm. You are told to seek The House of Yahweh. The Savior said it too. Then, the Savior, Yahshua Messiah, said The House of Yahweh, called the temple, would be destroyed. He was asked what the end would be. Eleven of the twelve Disciples were murdered, many of them in Rome. You can read information about the persecution and murders in our book, The Lost Faith of the Apostles. The Name Yahweh was forgotten for the title that originated in Egypt, given to dead pharaohs and later used to worship popular rabbis, who were deified. They were thought to work miracles. This title is now used in worship of dead popes. The title is lord or the lord. Notice the following information from Unger’s Bible Dictionary. RABBI (Heb. rabbi, Gk. hrabbi, “my teacher”). A respectful term applied by the Jews to their teachers and spiritual instructors (Matt. 23:7-8; John 1:38; 3:26; 6:25). The terms rabbi and rabboni both mean simply “master” (John 1:38; 20:16). The use of the title rabbi cannot be substantiated before the time of Christ. Later Jewish schools had three grades of honor: rab, “master”, the lowest; rabbi, “my master”, the second; and rabboni, “my lord, my master”, the most elevated. M.F.U. 2.Lord (Heb. Adon), an early word denoting ownership; hence, absolute control. It is not properly a divine title, being used of the owner of slaves (Gen. 24:14, 27; 39:2, 7, rendered “master”), of kings as the lords of their subjects (Isa. 26:13, “master”). To turn a person from all of the deception going on in this generation is virtually impossible. But Yahweh had a Plan from the beginning and His Plan is almost complete. Let man go his own way, Yahweh said to His Prophet Samuyl, and I will prove to him what Satan, and the other Gods (demons), will bring. Warn them, but let them go their own way or let them choose the Kingdom of Yahweh and Yahweh’s Righteousness in obedience to Life. If they choose Yahweh’s Righteousness, then what? And Peace, yes, True Peace. Did you notice that Yahweh’s Way will bring peace? All will not die. Those who are left alive will be those who have repented and converted to practicing Yahweh’s Laws and will be protected by Yahweh, because this Last Days’ House of Yahweh is forever. Remember, the gates of hell will not prevail against this House. The High Priest is Yahshua. Notice what the High Priest Yahshua is over–the Work, the Teaching. Wow! Did you notice Yahweh’s Laws are not abolished? Well, what about the Sabbath Appointments with Yahweh? Wow! They were lying after all. Was the Great Prophet of Yahweh speaking of them? 18 But first, they will be rewarded according to their works; they have repeatedly transgressed My Laws and thus have sinned, because they have defiled My land—they have filled My Inheritance with the carcasses of their detestable and abominable Gods (elohim)! 19 O Yahweh, my strength and my fortress, my refuge in the day of affliction, the nations will come to You from the ends of the earth, and will say: Surely our fathers have inherited nothing but lies and vanity; worthless, powerless Gods (elohim), of no use at all! 20 Do men make Gods (elohim) for themselves? Yes, but they are powerless! 21 Therefore behold, I will make them to know—this time I will teach them My Power and Might; and they will know that My Name is Yahweh! That’s what turns the hearts and minds to Righteousness. 1 For, behold, the day comes that will burn like an oven; and all the proud, yes, and all who do wickedly, will be stubble–the day that comes will burn them up, says Yahweh; and it will leave them neither root nor branch. Yahshua’s Memorial and Yahweh’s Passover Feast of Unleavened Bread is April 13 through April 21. It’s a hard thing to come out of this sinful world, but it is possible; otherwise, Yahweh would not tell you to do so. Notice the call of Yahshua Messiah and the High Priest over The House of Yahweh now! Remember, the House of Yahweh was also prophesied to be established in this present prophesied generation. It was established and it is doing exactly what Yahweh said that it would do.